Snooker's current world No. 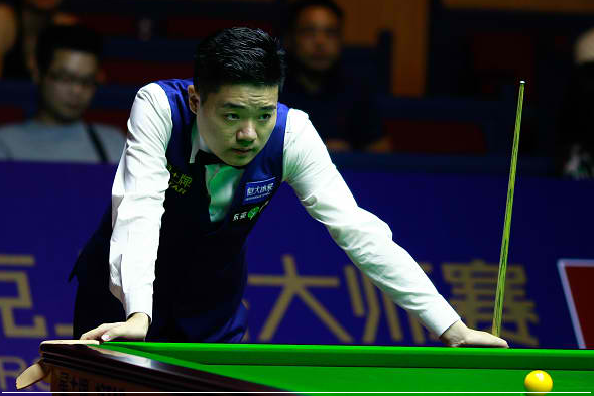 9 Ding Junhui of China survived a scare on the opening day of the tenth edition of the Shanghai Masters to edge world number 114 Scott Donaldson of Scotland 5-4. Donaldson, 22, looked set to pick up the biggest win of his career so far, as the native of Perth made breaks of 56 and 42 to move 3-1 in front. Ding retaliated and leveled the match, but Donaldson was able to prevail and took the seventh frame to go 4-3 ahead. Ding was able to force a decider and got in first with a break of 40, but it was the Scottish cueman who had the frame at his mercy with just two red balls left on the table. However, Donaldson missed a simple black and allowed the Chinese snooker star to callously clear and complete a come-from-behind victory. Meanwhile, English professional snooker player Martin Gould gave in to a shock 5-0 lost against Chinese youngster Yuan Sijun. This is the second time Gould has been on the end of a whitewash against the 16-year-old cueist, who defeated him at this year's China Open with the same scoreline. Sijun made breaks of 111, 65 and 48 on his way to the win. With the victory, he has booked a last 32 clash with World Champion and reigning world no. 1 Mark Selby. In the other matches of the tournament, world no. 13 Marco Fu of Hong Kong, China continued his first-round losing skid after surrendering to the 38-year-old David Gilbert of England 5-4. According to the South China Morning Post, it was the third in four ranking events that Fu has played this season so far that he failed to advance to the second round of the competition. He reached the second round at the Indian Open. World no. 19 Liang Wenbo overcame tourney's wildcard Hu Hao. The 29-year-old Chinese made breaks of 80, 76 and 44 to take the match with a 5-3 win.